Volume of LCL cargo – Less Container Load cargo – Some facts. Can I appoint a Surveyor to measure my packages of export at CFS/ICD/Dry Port? Do I get Surveyor’s report on my goods surveyed at a CFS/Dry Port/ICD? We – exporter – could not measure our LCL shipment at factory. How can we know the exact volume of packages? Under LCL shipments, freight charges are calculated on the basis of volume of cargo. Due to many reasons, the shipper can not declare the exact measurement of cargo volume while shipping, unless otherwise any of the parties specifically instructed. Once after movement of goods from shipper’s factory to container freight station for necessary export customs formalities the cargo is be offloaded at customs location in a ware house, container freight station or Inland Container depot. A marine surveyor appointed by CFS/ICD authorities survey the goods and records a survey report at each customs location of Container freight station/ Inland container Depot. This survey report helps shipper, carrier, CFS/ICD authorities and other related authorities to know the details of cargo including the measurement of packages. The said marine surveyor issues a survey report to the concerned which can be used as an official document of survey on said cargo to be exported. The freight forwarder who consolidates the cargo (carrier of goods) charges freight amount on the basis of volume of cargo in LCL (less container load). Would you like to add more information about measurement of volume of cargo with a surveyor? Share your experience in handling marine survey activities under LCL Less Container Load goods. 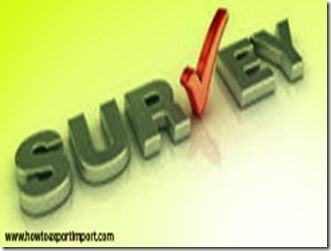 Comment below your thoughts about survey of goods under LCL shipments. How important Packing in export trade ? How to find Basic Ocean freight under LCL shipment? How to export from India to South Korea?